So you did it! You landed that big interview for your dream job, the one you have really been hoping for, and now you just can’t wait to show the interviewers what you know and why they need you. And this really is the one. It is a high level – strategic leadership or executive position – the kind that you believe will elevate you to that platform (you know the one where the “real” decision makers are). Whether the organizational culture and the job will actually turn out to be what you expect, or if you will ever get the onboarding, resources (people, money, space, equipment) or leadership support you need is a whole different story and a whole different article. For now we are focusing on the euphoria moment, the excitement and nervousness that come with simply getting the interview and what preparation techniques you can apply to properly channel that euphoria and actually lock down that job offer. As in all interviews, your goal is still to leave the interviewers thinking they just cannot live without you, but at this level, interviewing for senior management and executive positions, the added dynamic of strategic thinking is at play. Are you ready for it? I have interviewed a few really great candidates in my time. You know those applicants that leave you feeling, even before you are done with the interview, that you just have to get this person on your team! I have interviewed some individuals who were so good that they had me bursting inside trying to contain my elation. Even when I still had other people to interview, I would already know whom I wanted. Job offers for senior positions happen when candidates find that sweet spot where preparation, delivery and strategic thinking line up in the interview, and when this happens, the candidate moves from good to great. Great candidates demonstrate exceptional preparation and interviewing skills and a level of “thinking” that their competition is simply clueless about. If I can toot my own horn for a moment – wait a minute, I am writing this so I will. I believe I must have found that sweet spot in my career because by successfully using the techniques I am about to share, I received job offers from at least 90% of the jobs I interviewed for. I did not always get the interview, but if I could just get that interview, I knew I could create that sweet spot – and for the most part, I did. And, I accomplished securing great roles of ever-increasing responsibility and authority without knowing the interviewers or having prior connections or relationships with the organizations. So what are the winners doing? Sidebar: I use the word “winners” to refer to people who are out there beating the pavement (virtual and real), working to get those jobs and promotions when they don’t know anyone at the company, aren’t related to any member of management and don’t fund or lobby/advocate for any company programs/services. Getting the job offer when you are an “unfamiliar” entity to the organization and its leadership is a big, big deal (I started to phrase it the way Vice President Biden did, but I decided against it). Close sidebar. Again, so what are winners doing? They prepare big time, they present and deliver exceptionally well, and they demonstrate an unusual ability to THINK – both inside and outside the proverbial box. Review any and all available reports; i.e., strategy, financial, company performance, reputation, future outlook, past, current and future challenges (use industry journals, the company website(s), corresponding websites, news organizations and so forth). Be deliberate about finding out where this company has been, where they are and where they want to go. Try to get a feel for the culture; this is hard to do until you are actually on the inside, but you can garner some basics like formality, friendliness, structure and so forth by the website and, even better, social media. Learn all you can about the leadership team and, specifically, the person you would be reporting to; use the company website; read bio pages, social media (especially LinkedIn), and read blogs to see if any of these people are writing about things/topics that you should know about. Finding relevant connections between you and them is critical; you might find something worth mentioning during the interview or in your thank-you letter. Get a copy of the position description, if possible, forwarded to you. You might already have the job posting, but you want to get your hands, eyes and mind around that position description so you can better prepare. Preparing a comprehensive portfolio packet for each member on the interview panel. Include things such as your cover letter, resume or curriculum vitae, a list of directly related trainings/workshops/seminars/certifications that you have completed beyond what is already listed on your resume/CV; add in a relevant work product and/or writing sample. Learn the names and titles of everyone who will be interviewing you. Not only is the person you would be reporting to important to research, but check out everyone who might/will impact the hiring decision (include all the panel members and the chair of the search committee or firm). Knowledge is power, and you might learn little tidbits of info that you can subtly use to make a connection. Find out what is important to these people so that you can find alignment and bridge gaps between them and you. If possible, check out what the current executives and senior managers who work there are wearing; your image should align closely with theirs or one step above (you can be a little bit unorthodox but not too much). (3) Incorporating questions that reflect well on your strategic thinking abilities. 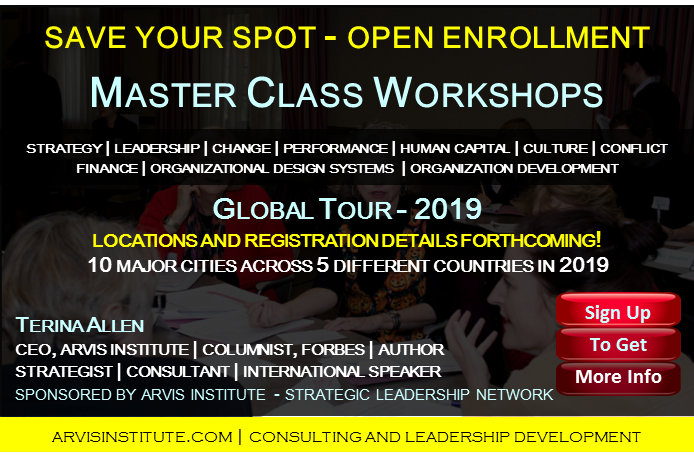 To demonstrate the questions effectively, I have provided an example for a senior-level position that I am calling a “Global Director of Organization Development and Human Capital.” The position is in a global oil and gas company, and the company’s name is ABC Company. As you read below, and especially when you prepare your own strategic think questions, replace the stated title, company name and specific focus points with those fitting to the position, company and specialty areas for you. The candidate that goes in solidly prepared, presents an executive presence, and communicates well will do a great job and be considered in the running for the job offer. 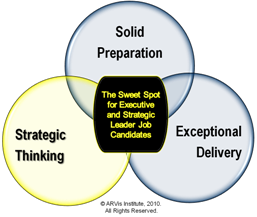 The candidate that goes in solidly prepared, presents an executive presence, communicates well and asks these types of grand strategic thinking questions will do an exceptional job and receive the job offer! Organizations know that it is relatively easy to teach a person a set of data, information or knowledge, but it is much more difficult to teach someone how to “think.” So do everything else regarding research, dress and communication and then ask your strategic think questions, and you will exceed expectations and give yourself an advantage for getting that job offer. One more thing… Be savvy enough to incorporate some of their answers into your thank-you letter and remember this stuff for application and success after you start the job.